is this the least painful and safest way to ride such an animal. What is more important? Your favorite cultural cloth or your life? fail to account for all elements of the complex multidimensional equation of the tragedy. One such dimension for example, that of Anglo Irish relations, is the complex byproduct of hundreds and hundreds of years of interaction between the cultures of Ireland and those of England. The "bad blood" between the two which was present during the famine years was produced by the two players equally as one pushed and the other shoved back over time. Additionally any study of the Famine must recognize that there are two distinct cultures involved. The attributes of each culture both, Celtic and Anglo, structured in a particular and causal way the relationships of both to the challenges presented by the failure of the crop. Thus the inner nature of both cultures as cultures rather than as simply political entities must be carefully examined. To fail to do so turns a blind eye to the role of culture in the shaping of choices and reactions and reduces human beings to automatons devoid of free will wedded to a teleological destiny .As they say "it takes two to make a fight" we must also say that the particular culture of a people provides a particular strategy of interaction which propels that people through time. Sometimes the culture is able to pass through history as it were as the round peg through round holes. In other times, however, culture becomes the solution of the square peg in the round hole- the misfit not withstanding driven painfully and unmercifully onward by a people that for an illusive reason, will simply not exercise their free will to select another path, another solution. This is an important dimension of the famine which persisted and developed over hundreds of years and which must be taken into account. It is the force of this dimension which propelled the two peoples involved into the crucible of the famine which seems to be, in uncritical retrospect, their manifest destany-when in fact it was the sum product of their particular choices over time- a long time. I am not saying here that the cultural dimension was the most important causal dimension nor that it was the primary dimension. I am simply saying that any analysis that fails to account for it is flawed. Americans today generally view the history of the Great Irish Potato Famine (1845+) through cultural lenses which tend to distort the realities of history as often as they magnify elements of truth. These lenses develop as a result of the normal processes of folk oral traditional transmission but are also imposed by political organizations with axes to grind. It is important while examining the history of the Famine to begin with the facts and only once the facts have been revealed move to enjoy the folk oral tradition which has developed around it and then to the respect for the suffering brought by the tragedy. We must do this because the lessons of the Famine have not yet been learned. The 20th century has seen little if any progress toward the elimination of famine from the human condition. We cannot allow the tears nor the methods and causes of politics to obscure the facts and prevent change and the learning of the lessons of this tragedy. of the lives of the Irish for centuries. human suffering being in the balance. Up until this time the Irish people were dependent not only upon the potato as a source of food and income but upon the purchase of other foodstuffs which they produced including a most important one--wheat. The purchase of great quantities of Irish agricultural produce by England helped the Irish economy to grow and the people to prosper. The excessive demand created by the English war efforts distorted the Irish economy. When the major European wars came to an end, England reduced dramatically its investment in Irish agricultural products. Ireland received great prosperity from the English. The dependence of the Irish upon the potato helped greater numbers to survive. Potatoes which could feed many could be grown on small plots and not detract from the payments due the landlord for cash crops. However, none of this growth would have been possible without the presence of a thriving economy--potato or no potato--and the prosperity which brought growth was provided by England. England was a valuable trading partner--even if a politically dominant one. With the end of a boom, however, comes a bust and unemployment was the result. It is the backdrop for the famine and a primary underlying foundation for the events and suffering which occurred. Two-thirds of the Irish were dependent upon Agriculture as a source of income. The remaining one-third engaged in other industrial and economic pursuits did not fare well in competition against a developing English manufacturing and industrial economy. Business was lost. While England was indeed a major economic force, a great burden for the failure of the Irish economy to grow outside of Agriculture has been associated with the ways in which the Irish as a Culture adapted to the new industrial economy--the ways in which businesses were established and the inability of local groups and organizations to pool resources to foster economic growth (especially in the Fishing industry). These problems are seen by economists not to have been caused by the dominance of England but by the choices of the Irish informed by cultural tendencies and practices. Successful economic strategies, products and markets were not developed. Relief Works: The English Government paid half the cost of such projects. 140,000 persons were employed at one time. Such relief projects are often ridiculed in popular accounts (canals with no water, famine roads going nowhere). But there were also very important functional projects such as docks and roads which are still in use today. These projects were designed to provide money and income to help the Irish survive and they did help. While it has been argued that such projects were too small in scale they do nonetheless represent a significant investment by the English Government and it is also suggested that the scale employed was done in good faith that such programs would be successful. The English government provided 365,000£ sterling to the Irish people in the form of loans in 1845-1846. The Protective Tariff on grain was repealed: The Repeal of the Corn Laws was a step designed to lower the cost of grain to the Irish. This decision was not popular in England and because he helped the Irish in this way the English Prime Minister was put out of office. Peel's government confronted a disaster the likes of which had never occurred in Europe. Economic depression as well as the Famine combined with economic re-alignment, changes in agricultural technology, and the rise of industry. The reaction of the English government was not unlike the reaction of FDR during America's depression era. Rather than hand out money and food, it was thought by the best minds of the day in England best to put people to work. The debate over the concept of public welfare is still raging in our country and throughout the world today. Then as now many believed that feeding the poor would produce greater numbers of hungry and compound the situation by creating the welfare dependent masses, ruining the work ethic. The government also did not want to totally close down the Irish agricultural economy (putting many more out of work to starve) by stopping the export of food. This point is often brought up in discussions of the Famine: How could the English continue exports of Irish food during the famine? There was a very good case made that should agricultural production for cash be shut down, the English would be hurting those that they were trying to help. (One should not miss here the similarity of the recent situation in South Africa. The U.S. discouraged boycott so that African workers would continue to be employed and the country could remain stable to bring about reforms in an orderly way.) The English Government hoped that through the application of funds and aid received from English taxpayers that the needs of the Irish people could be met. However, the disaster was far too large and complex. When we read of the actions of the men of the day, let us remember that England at that time was the culture and society written about by Charles Dickens with all of the flaws which he described in his novels. Often as we look back upon historical events we people the world with ideal human beings designed complete with our own morality and cultural values. (Sometimes also we populate the world with humans who are designed as demons!) To ask for a man dedicated to modern concepts of human rights to stand up within the ruling classes of the world at that time would be the equivalent of asking the contemporary Irish peasant to turn on a light bulb to illuminate his or her cottage; they simply had not been invented yet, at least in any great numbers. In fact, the Famine would lead to the generation of modern relief methods and practices and their implementation for the first time. Bear in mind also that conditions in the USA were also not that wonderful. In 1845 slavery was still with Americans as was the cruel opening of the flowers of the industrial revolution which consumed their human workers, both immigrant and native alike, as Venus fly traps made of factory machines. Under the new government an economic philosophy called Laissez-Faire dominated the thinking of politicians and economists who desired to manage the economy. Still today, our own world economy is managed by economic gurus in the United States Federal Reserve working not from a concrete and exacting science but from a philosophy (no longer Laissez-Faire) which just happens to work from time to time. Laissez-Faire as a philosophy called for non-intervention by government in the economy and held that it was wrong for the government to meddle in economics at all. Charles Wood believed this strongly and he was the Chancellor of the Exchequer under the new Russell Government. Charles Trevelyan was the head of treasury--a permanent position--and he agreed. It is not that the government did not try to solve the Famine but that the economic theory (the specific cure selected) failed, as did the crop and the economy and the future plans of agricultural development. Government funding for aid and purchase of food was discontinued and the responsibility for aid placed into the hands of private enterprise. (Note the similarity to trickle-down economics and Reaganomics). Those who had the most to gain, it was thought, from economic prosperity would see to the protection of those who made that prosperity possible. The landlords and businessmen and investors, it was thought, had nothing to gain by allowing their workers to starve. Here several miscalculations were made. Just as the Irish culture was somewhat responsible for their economic adaptation or lack thereof, so too the culture of the businessman influenced their actions. Despite trouble with the economy upon which they depended, most landlords, Irish and English alike, living generally far away in England or on the Continent, maintained their lifestyles of conspicuous consumption as a cultural necessity maintained by cultural values. Landlords and businessmen did not have as pre-requisites for their employment humanitarian skills. (Actually according to Calvinism, grace follows deeds.) They were the same cruel and unsympathetic landlords and bosses described by Dickens. They were Irish as well as English living high on the hog. Note also that ever since the penal laws which limited Catholics from certain positions and occupations, that many Irish Catholics had entered the business community and were directly responsible for decisions made in economics and economic adaptation in Ireland. (Parnell discovered this following the Famine and stressed to the Irish people in his speeches that they should strike at the Irish landlords as well as the English.) It was only when the Irish realized that it was a class of people--landlords and businessmen--and not a Nation or a Culture which was guilty, that success and liberation eventually came. The Government targeted the Irish landlords as responsible for the Famine. They made them pay rates to support relief. In need of money for their high lifestyle, the landlords exacted the money from the agricultural work force, causing evictions on a large scale. At the same time they were also implementing modern agricultural practices which called for larger farms with fewer people resident and working on the land. Displaced agricultural workers could not find employment in industry which had not developed sufficiently in other areas due to the Irish cultural approach to industrialization, which favored individual isolated workers and small groups over factories and large cooperative concerns. Expenditures to the Irish from the English Board of Works amounted to 30,000 £ sterling a day with an administrative staff of 11,500 persons paid by the English. You can argue "Not enough in retrospect," but nonetheless it was not a small sum for the day. And this under a laissez-faire government. Governments solve problems with paradigms and they tried one they thought would work. We will never know if other tactics could have been seen clearly at the time. Epidemics of famine fever (typhus) and relapsing fever combined with dysentery, caused by consumption of turnips. Also Indian meal provided by the government did not contain Vitamin C, a fact unknown at the time. Famine dropsy or hunger edema occurred as a result. In 1847, 100,000 immigrants sailed to the U.S. (often via Canada). 932,000 were maintained on English government relief paid for by taxation of landlords. Population of Ireland was down to 6.5 million. (It had been 8 million in 1841.) Agricultural production had diversified and increased. Farm holdings were larger; a sort of cure, though costly, evolved without government intervention. No one point of view concerning the Famine can stand on its own. But we can start by gathering as many facts as are available from all sides as well as from some of the corners. The Irish Potato Famine was a multi-dimensional natural/economic/cultural/humanitarian disaster of huge magnitude. At every level there is enough blame to go around. As mentioned above- there were famines in all of these dimensions. We cannot leave any dimension out when trying to understand the event. The well-intentioned assistance at great political and financial cost to the English people and government must not be obscured by folklore or cumulative hatred. The role of both cultures in tragedy must be fully explored. While the culture of landlordism lacked humanitarianism, the culture of Celtic Ireland greeted potato dependence with open arms and failed to adapt to the new Industrial Age or cooperate fully with the political/economic system which was attempting to manage the land, the economy and administer justice. Cultural pride and Celtic/Irish ethnocentrism stood as a mirror to British Industrialism and Imperialism and locked the people between the image and the looking glass. Significant resources were expended by the Irish in hostility and conflict. In the end thousands left a sinking country to its fate. Foreign countries for which the Irish had fought and died in costly wars of rebellion did not arrive to liberate the people from both England and the Famine when they were needed most. Perhaps the greatest tragedy is the death of millions and the continuation of famines today to consume millions of lives unchecked. We cannot let history tell us that the painful fate of so many was somehow inevitable, that they could have done nothing over the centuries to escape it, because we too are those people. We just happened to have survived. Are we doing enough today to escape cultural ethnocentrism and political inflexibility which propel cultures toward famine? Is our cultural "way of life" so strong that we too may be investing centuries in our own destruction? Will the hole in the Ozone, global warming, environmental pollution and the American/International "way of life" be our crop failures? Has our cultural imperialism and ethnocentricity made friends or enemies of those we may one day come to depend upon as neighbors? Check http://faculty.wcas.northwestern.edu/~jmokyr/mogbeag.pdf . and you will find "Total famine mortality can be estimated by first projecting Irish population from 1841 to the even of the famine in 1846. We then add the births that occurred in the famine years 1846-50 and subtract out estimated out-migration during the famine years. This yields a total of 1.9 million people dying in Ireland in those 5 years". I've attached a chart on which we used that same logic with more data. We wanted to find mortality by year and used a table from the 1851 census that gave percentages of the total deaths by year. But first, we had to find the total deaths. We took the 1841 census (which was a 5.25% increase over the previous one) and applied it to the understated 1841 census to come up with a population increase year by year up to 1845. Then, we used the reduced increase quoted in a study published in the American Economic Review in 1994 that the annual birth rate during the Great Hunger had dropped from 5.25% to 1.4%. In this way we came up with an adjusted 1851 population of 13.6 million. Subtracting the inflated 1851 census number we realized at least a 7 mil reduction in population. Subtracting the million who fled, we get a total mortality of 6 million. 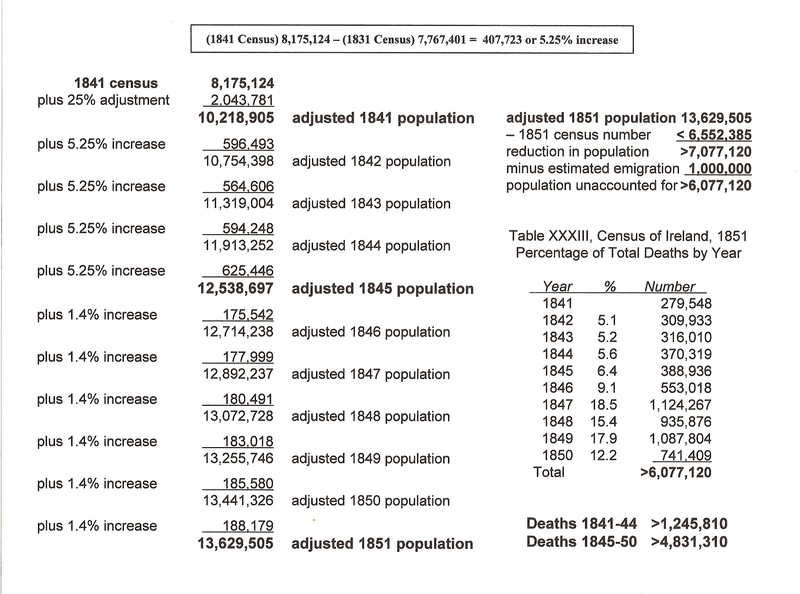 Then, using that 6 million with the table from the 1851 census giving the percentage of total deaths by year, we calculated more than 4.8 million deaths between 1845 and 1850. As incredible as that sounds, it's close to that cited on the memorial stone erected at Lios na Binne, a town in Cork that disappeared as a result of the Hunger. -Mike McCormack, 2/2009. Select view image for much larger original.